Are Limited To The Speed Of Light, But Only If The Signals Are Electromagnetic In Nature. Tesla And Alexanderson Engineered Wireless Transmission Systems With No Such Limitations That Were Fully Operational By 1917... Thereby Disproving Einstein's Relativity Before It Was Even Generally Believed By The Scientific Community!" REVEALED: The history of how Nikola Tesla and Ernst Alexanderson developed a wireless communication system that produced instananeous communications between a transmitter and receiver. The US Navy used this system for decades! 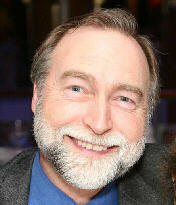 Eric Dollard is an Electrical Engineer who is a "living legend" in the field of electrical research. He is considered by many to be the most knowledgeable expert alive today on the true nature of electricity. Author of the landmark mathematical papers Symbolic Representation of Alternating Electric Waves and Symbolic Representation of the Generalized Electric Wave, Eric shows how all electric phenomena can be mathematically measured and engineered WITHOUT using calculus or "Maxwell's Equations." Author of Condensed Intro to Tesla Transformers and Theory of Wireless Power, he is also the only person since Tesla's death to successfully build a real Magnifying Transmitter. Eric Dollard's presentation from last year's conference is called Four Quadrant Representation of Electricity. There was so much interest in the publication of my book last year, titled "Wireless Giant of the Pacific," it became obvious that people wanted more. This lecture is my response. 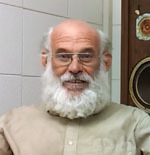 The objective here is to review the complete history of signal propogation from its earliest beginnings and to develop a "transmission theory" that includes both the electro-magnetic as well as the electro-static methodologies. Our modern world depends on our ability to send and receive information quickly from one place to another. We've all heard that these signals are moving around at the "speed of light." I review how these ideas became established and reveal some astonishing discoveries along the way. You see, there are two different ways of looking at electricity when it comes to wireless signal distribution. One is based on the "electro-motive-force" associated with magnetism, and the other is the "displacement current" associated with dielectricity. Today's methods focus mostly on the e-m-f's of magnetism and ignor the displacement currents of dielectricity. This creates an unbalanced system with significant limitations. Only when both processes are equally involved can you create a balanced system. From this basis, I then go on to describe the terms that are used to characterize "transmission systems" in general, with the principle functions being "inductance" and "capacitance." To show this development in its proper historic perspective, I begin with the experiments of Stephen Gray in 1730, and show the progression of ideas through Benjamin Franklin, Mahlon Loomis, Heinrich Hertz, Nikola Tesla, Guglielmo Marconi, Reginald Fessenden, Walter Massie and Oliver Heaviside. There were other significant contributors, as well. From this foundation, I use diagrams to establish the Michael Faraday - J. J. Thompson "lines of force" theory and then use that theory as a model to show how electrification orients itself in the different types of transmission configurations. This study is important because it demonstrates the relationship between the way the lines of force are directed and the direction of the propogation of the signals that are generated. This method establishes the basic building blocks of a "transmission network" and the different configurations involved in electro-magnetic and electro-static propogation, as well as the different characteristics of transverse and longitudinal signals as they move through these networks. Since actual working models of different transmission systems can be built and bench tested from this method, actual test results can replace mathematical calculations as a means to study these phenomena. The term "analog computer" is used to describe these models because direct measurements and computations can be made anywhere within the model during its operation. I then move beyond the theory of how to do this and present actual working models and data with numerical values for given currents, voltages, and power flows through the transmission networks. No one has ever done this before!! I finish by showing the complete electrical characteristics of the various transmissions systems used in the last 100 years. This includes the later Marconi systems, the Tesla system, and the later Alexanderson systems used at New Jersey, California, and Hawaii. This is the first time in history that this complete method of analysis has ever been revealed. With this process, the electrical characteristics of any transmission system can be modelled, studied, perfected, scaled-up, and implemented on an industrial scale. In 2007, the San Francisco Tesla Society visited me at my research facility in Landers, California. I insisted that we film a documentary covering the technology because it was about to be taken from me. This was to include my research into earthquake detection and the general monitoring of longitudinal, electro-static signals emanating from the earth. This video tour documents the facility and the scientific achievement it represented. This facility represents almost three generations of work starting with George Van Tassel at the Integretron, which is located next to this Landers Facility. The land owner Walter J. Deroche had commissioned me after the Integretron was taken from me and I needed another place to continue the work. So this began on Walter's property roughly 1000 feet from the Integretron. Walter's idea was to build our own Naval Communications facility based on the materials that were moved from the RCA Station in Bolinas, California to Landers. This was a dream that we had both shared. At that point, I continued the research of the Radio Corporation of America (RCA) on Walt's property. Ample assistance of materials were provided by Walt's friends and associates who worked in the aerospace and telecom companies in the Southern California area. And much of the equipment was hand made by me from surplus gathered in the Los Angeles area. Over a course of time, one of the biggest communications research installations in private hands grew out of this effort. Under suspicious circumstances, Walt died but in the course of his passing had willed the installation to myself and the telephone line foreman who helped me build the place. Unbeknownst to me, efforts were made behind the scenes to tamper with the paperwork and the will. Eventually, the property wound up in the hands of an Olen Bales at which point a $250,000 ransom was demanded or he would destroy the station. When the money was not forthcoming, Owen declared me a squatter and had the legal system remove me from my own installation and the facility was looted of all of my property, possessions and equipment at which point I became destitute in Lone Pine. Considering that the installation was the most advanced "listening station" ever built outside of the control of the military, its loss was catastrophic and irreplaceable. So, what was there? This film is a complete tour of the facility with me explaining the scientific significance of each and every component filmed. This includes the "antenna farm" which held Broadband High Frequency Antennas, Broadband Low Frequency Antennas, a Marconi Antenna, a Rhombic Antenna, an Earth Signal Antenna consisting of a Beverage Antenna and an Alexanderson Antenna in tandem. It also had a stereo broadcast and receiving antenna for the entire high frequency band with worldwide range of reception. It allowed for the determination of the directional origin of the signals, which were heard in stereo. In effect, the Earth became a concert hall of enormous proportions. Unfortunately, before much of this could be recorded, the station was lost. And then there was the Lightning Indicator system which measured the voltage gradient between the local sky and the ground, and set off an alarm when lightning was about to strike nearby. For listening to signals in the earth, there was a series of sensitive microphones buried around the property, as well as the Alexanderson Antenna that consisted of a loaded pair of "above ground" and "below ground" lines that were compensated to eliminate speed of light propagation rate limitations. Each of these antennas is shown and explained out in the field, so you can see for yourself the physical structures used to accomplish these technologies. All of these antennas produced their characteristic signals, all of which were routed back to a central signal processing area after going through an initial "lightning arrestor" filter. Then, each signal could be selected for individual monitoring. Most of these signals were entering this area in the micro-volt range. These signals were then filtered to eliminate noise and interference, and then amplified back up to their original levels. Further amplification stages carefully brought the signals up to the kilovolt power levels. After this, the signals could be amplified to be listened to through headphones, or through loud speakers, they could be viewed on oscilloscopes, or used to activate chart recorders, or even close relays to sound alarms. They could also be piped into a telephone line to be played to anyone else who was listening. And all of these output systems were completely compensated so they did not load the initial signal from the antennas in any way. The entire facility was operated on battery supplies that were 100% isolated from the local utility. The signal processing was all done in the native, analog modem to preserve the fundamental character of the signals. There were no digital computers involved in the signal processing; only analog computers were used. Many considered the design to be beyond brilliant, and much of the facility was operational. The last section includes over 20 minutes of listening to signals from the Alexanderson Antenna while watching them on an oscilloscope. If you have understood the scientific significance of my presentation The Extraluminal Transmission Systems of Tesla and Alexanderson, then here is your only chance to see a fully functioning system in action with a full technical description. My book about the Wireless Giant of the Pacific tells about how this technology works, but this film shows one of these systems actually working! It's hard to understand how historically important this film is, because it is the only detailed record of this facility ever made. Technically, the film has some weaknesses, like during the tour of the Antenna Field, the wind came up a bit and played havoc with the microphones. Even through this, my periodic comments reveal priceless details of the structures and their operation. Over all, the film may leave you breathless once you comprehend the scope and magnitude of the facility and what it represents. What you will see is the scope and function of the Landers Facility, which at the time was the culmination of my life's work! Many years ago at Borderland Science, I had two presentations - Transverse & Longitudinal Electric Waves and Tesla's Longitudinal Electricity which are considered classics in the field of Tesla research. The first shows you the difference between transverse and longitudinal waves and then some practical demonstrations. The second goes deeper into longitudinal waves including a transmission demonstration. Einsteins so-called speed of light limit is circumvented since the longitudinal propagation goes through counterspace, which is instantaneous meaning there is no velocity. It is not faster than light, it is instantaneous extraluminal transmission, which is way more advanced than what Einstein was ever able to conceive. Since those demonstrations many years ago, a lot of my work has focused on fully developing a fully working theory that. It is somewhat mathematical but will still use only basic algebra. You will get a very detailed analysis of the Alexanderson System as well as learning about wave propagation in multiple coordinate systems. Physicists use the term dimensions so in other words, it will be about wave propagation in other dimensions that are outside of the velocity of light. The analog computer network systems will be a central figure in this presentation. And, this presentation is directly related and very important to the understanding of my Advanced Seismic Warning System. The complete history of the development of wireless signal transmissions and how these discoveries differ from "radio" today. The complete review of the Faraday-Thompson "lines of force" theory and how it can be used to model the different methods of transmission! The use of "analog-computers" to build working models of various transmission systems so their characteristics can be measured instead of merely "calculated" mathematically. Finally, the complete mathematical process whereby the electrical characteristics of any transmission system can be fully expressed, allowing working models to be built, tested, and scaled to any application. You'll find out what it is about when you download it! A complete technical explanation and visual inspection of the Antenna Field at the Landers Facility. Every major antenna system was visited out in the field and their structures explained. A complete technical explanation and visual inspection of the equipment used in the signal processing shack where the chorus of signals from this planet, detected in the antenna arrays, were isolated, filtered, and amplified in their native analog condition. A review of all of the safety systems are shown and explained, as well as all of the isolated power supplies and battery banks that could run the facility for days without external power. There is also a complete visual inspection of the signal recording equipment, that could make chart recordings, audio recordings, or signal alarms when an event was imminent. If you have ever wondered whether there is a practical application of Eric's work, then this film will show you how vast that application has been in the past and could be, again, in the future. 4 Hours 4 Minutes video presentation of Electrical Transmission in Multiple Coordinate Systems by Eric Dollard from the 2016 Energy Science & Technology Conference. 301 page PDF document of the PowerPoint presentation from the conference. The theoretical basis for longitudinal transmission systems as demonstarted in the classic Borderland Science videos showing "faster than light" transmission. In reality, EXTRALUMINAL means it is complete disconnected from the speed of light. The most detailed presentation on network theory in history - considered the most complicated subject in all of electrical engineering. The math and schematics to replicate these analog computer networks that transmit in both transverse (electromagnetic) fashion and in longitudinal (dielectrical) propagation. SYSTEMS OF TESLA AND ALEXANDERSON! "Eric is a very unique and brilliant scientist who lives in the desert and ponders questions and ideas on transmission line theory and the electrostatic universe. His presentation dealt with the complete history of the development of ac power and radio communications. A once in lifetime opportunity to absorb the genius of this man, shunned by the mainstream, but still pushing the envelope. To think that I was there at one of his presentations, whoa!" "Eric systematically redevelops the history, the theory, the math and the working models of the generalized transmission system methodology, and publishes, for the first time in history, the method whereby any signal transmission system can be characterized and replicated. This includes the "faster than light" systems of Tesla and Alexanderson which utilize "instantaneous" longitudinal electro-static pressure-waves in the Earth. Any electrical engineer who can't design and build a real Tesla Coil after this needs to take up basket weaving! The mystery is solved. Thank you, Eric!!" "For Eric Dollard, ham radio, Tesla and electrical experimenter enthusiasts, this is a rare, golden and historical video footage. Going backwards in time to the year 2007 the video takes us on a personal tour of the Landers Installation. The whole system is explained piece by piece and in tiny detail. - Watching this video is like being there, going on a personal tour with Eric himself. Understanding the scope and magnitude and the lifetime effort of work invested with this installation is simply not possible until you've seen this video. The unique knowledge of Eric Dollard is demonstrated with this tour! Everything is very well organised and professionally built and it is a testament to his ability as an electrical engineer! You will see it all, the whole installation. The Antenna fields, Control panels, the famous Corolla, Varmint the dog running free and more. It is also an emotional journey to watch this video, knowing that it has since all been lost. One can now understand the heartache that Eric felt when this installation and lifetime of work was taken from him. This video is the real deal! - Essential viewing for the complete understanding of the Landers Installation and the life work of Eric Dollard. We're inside with control panel nearby, (take note of the small picture of Alexanderson pinned on the wall). We're sitting down at a desk with Eric to do some simple math. This feels like your there yourself having Eric tutor and explain it to you personally. Now we take a look at the control panel and the earthquake system. Eric works the panel and sets it up to listen to the underground signals. You can see the Eric's eyes light up when he describes his system. Here we follow the lines feeding the panel, out to the outside radio real-world. Here we encounter the all of the outside elements. We see the lightening arresters and the high voltage, high impedance, circuits for the HF antennas, one up and out overhead and the other into the ground. We see the low band and high band antennas for CW. Now we see the wave collimator or wave projector, where it works on all the ham bands within their range. Rhombic beam one and two are logarithmic golden mean proportioned array of ever increasing lengths. The famous Corolla is seen which is actually in tandem to the main installation. Now we see some close up views of the oscilloscope screen showing the signals from the Earth. Some sounds are also heard. Lastly we sit down again where Eric further explains some diagrams, schematics and some theory behind it." "In this exclusive video Eric Dollard takes us on a unique and fascinating journey through the Landers facility. Erics enthusiasm and passion is clear as he truly wants us to understand the workings and arrangement of the seismic warning system, and he leaves no detail untouched as we follow the signals path through the system from beginning to end, as each components purpose is thoroughly explained and documented along the way. We look over his shoulder as he works us through and explains the theory of electricity as well as his own model of electricity, before he takes us out to the desert on a guided tour of the antenna field. This practical and visual guide compliments his Extraluminal Transmission presentation perfectly and enables one to understand more of the theory as well as to see the physical arrangement and construction of the systems so often referred to. Eric also briefly speaks about the work of Dr. Royal Rife and shares practical information that would enable the observant researcher to develop their own experimental Rife system and begin their studies. This tour is perfect viewing for technical people and experimenters who like a hands-on perspective, as well as theorists who would like to see how the systems are arranged and operate in the real world. Eric leaves us with no doubt as to the scope of the operation at Landers, and the significance of the loss of such a facility, from both the humanitarian and scientific viewpoint. This puts into clear perspective the importance of what hes trying to accomplish once again through his work today. >From power supply to monitoring apparatus, this technical tour reveals all." Nobody has ever seriously discussed the engineering parameters for designing transmissions systems in the public domain before. I've spent almost 40 years and hundreds of thousands of dollars studying this subject. Please support my work by getting copies of my presentations. 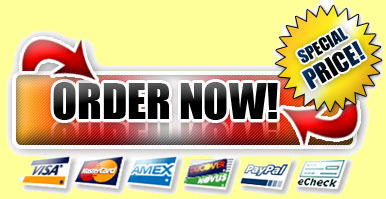 GET THE COMBO OF THE ABOVE 2 AT A HUGE DISCOUNT! SUGGESTED RETAIL PRICE FOR BOTH PACKAGES! 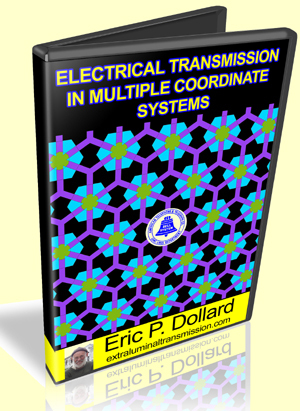 Get your hands on The Extraluminal Transmission Systems of Tesla & Alexanderson and/or Eric Dollard's Telluric Research and/or Electrical Transmission in Multiple Coordinate Systems right now. You have 60 days to check out The Extraluminal Transmission Systems of Tesla & Alexanderson and/or Eric Dollard's Telluric Research and/or Electrical Transmission in Multiple Coordinate Systems -- risk free! 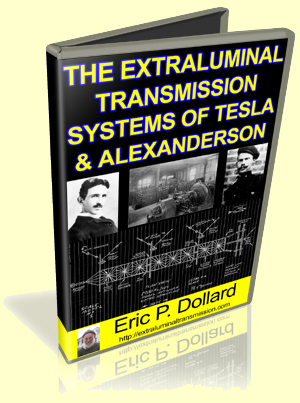 The Extraluminal Transmission Systems of Tesla & Alexanderson and/or Eric Dollard's Telluric Research and/or Electrical Transmission in Multiple Coordinate Systems Now! get your hands on The Extraluminal Transmission Systems of Tesla & Alexanderson and/or Eric Dollard's Telluric Research and/or Electrical Transmission in Multiple Coordinate Systems now before it slips your mind. Eric, I'm ready to add this incredible lecture about The Extraluminal Transmission Systems of Tesla & Alexanderson and/or Eric Dollard's Telluric Research and/or Electrical Transmission in Multiple Coordinate Systems to my library right now! I can start enjoying and benefitting from it right away. THIS PACKAGE IS 2 ZIP FILES. THE FIRST ZIP HAS A PDF OF THE POWERPOINT PRESENTATION GIVEN AT THE CONFERENCE AND A MP4 VIDEO OF THE FIRST HALF OF THE PRESENTATION. THE SECOND ZIP HAS A MP4 OF THE SECOND HALF OF THE PRESENTATION. 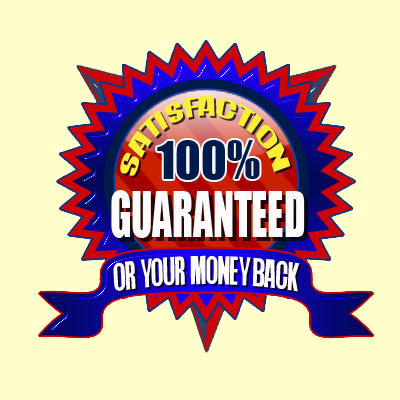 PLUS, YOU GET A 3RD BONUS ZIP FILE WITH A MP4 OF A 57 MINUTE SURPRISE VIDEO!!! 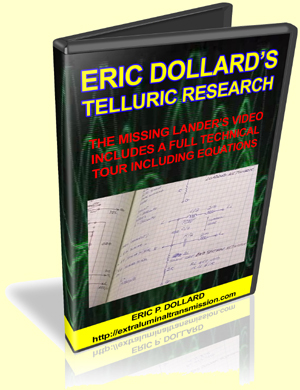 Get The Extraluminal Transmission Systems of Tesla & Alexanderson and/or Eric Dollard's Telluric Research and/or Electrical Tranmission in Multiple Coordinate Systems right now and study it carefully. Then decide if this lecture doesn't share the most direct information on how to improve the efficiency of any machine or energy system, at ANY price!